It’s so much easier and less nerve-wracking to coddle our kids than allow them to fall on their faces. It’s so much better for them to bite it, though, as it not only let’s them experience failure, disappointment, and sometimes physical hurt that is required for them to keep perspective, but also can provide motivation for them to try again and confidence to keep going . I like to think of myself as a hands-off parent, who gives my kids latitude when it comes to learning how to do things on their own. I like to give ‘em the tools and let them put in the effort. It’s great to hold that image, but the reality of the situation is that sometimes I baby them. From helping them get ready for school in the morning to holding their hands when they’re learning to ice skate, I provide extra assistance that they just don’t need. I may want to give it and they may want to receive it, but I’m really not doing anyone any favors. We’ve always treated my eldest daughter like a little china doll, so delicate and frail. While we tried to teach her to shake things off when she fell down or hurt herself, she seemed to need, or we seemed to need to give, a lot of reassurance each time. The tears over taking a tumble on her scooter always elicited back patting and hand holding from us, and a wipeout on her skates was always instant hysteria. My 4-year-old has helped me learn to back off, though, with both of my kids, as she literally pushes me away as she always wants to do everything by herself. Since she learned how to walk, she’s been on her own. “I want to do it myself, Mom,” she’d say when I’d try to help her get her coat on. If I’d cajole one arm into her coat without her doing it on her own, she’d rip her arm out of the sleeve and put in back in….by herself. 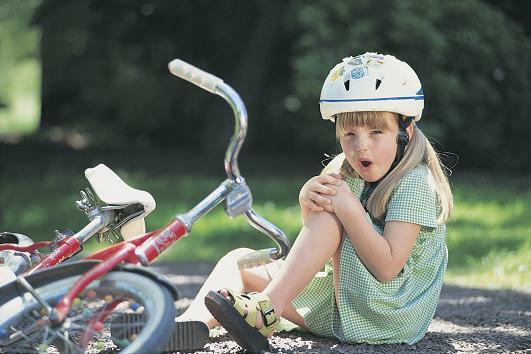 “I can do it,” she’d say as she was rolling herself away from me when I tried to help her ride a bicycle without training wheels. She’d crash and fall and cut things open, but she finally did it….by herself. The two girls have let their individual approaches blend a bit over the years, making my older daughter a bit tougher and my younger daughter a bit more calculated in her steps. It’s helped me develop a more unified approach to ‘helping’ them as well. My parenting approach regarding what they ‘need’ in regards to freedom to do things for themselves was put to the test recently at a day-ski resort. While my girlfriend grew up skiing big mountains, I’d never done more than tobogganing in the Midwest. We went for a day as a family last year and the girls and I took our first ski lessons. We had a wonderful time and by the end of the day, maneuvered the bunny hill together. This year we went back again, this time with friends, and put the girls in kids ski school in the morning, while I took a lesson of my own and the other adults skied without hindrance from the beginners. At lunch time, the kids excitedly told us how they’d graduated from various stations on to the next. Since they were making such progress, we decided to register them for the afternoon kids’ classes as well. After paying for the additional lessons, the ski school instructor asked me if I wanted to give my consent for my older daughter to ride the ski life unassisted. I was dumbfounded with the question, as I’d just ridden the ski lift unassisted for the first time in my life twenty minutes ago and fell flat on my face when exiting the chair. It had been hard to get up and out of the way, and eventually the lift had to be stopped to accommodate me. And that was just the ride up! I won’t even broach the fear, excitement and wipeouts I encountered on the way down the hill. 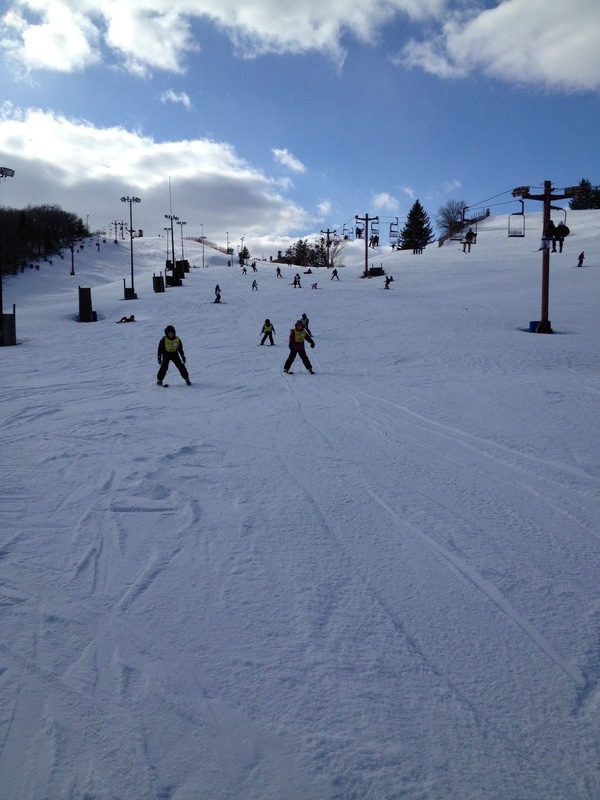 As I stood there pondering how to answer the question about the lift for my daughter, I remembered the excitement and sense of pride my daughter had just a few minutes ago shared with me over learning to ski….on her own. I gave the woman my consent and hurried back to the group to give them the go-ahead for ski school. I wrestled with my own learning curve throughout the next few hours skiing. While I mastered the lift, controlling my pace on the mountain was proving problematic. I kept forgetting to turn to slow myself down and ended up face down in the snow on numerous occasions. I knew I’d eventually get it, and my girlfriend and friends thought I’d have an easier run on another trail. We headed over to the other hill, which was situated close to the kids ski school bunny hill. As we stood in line for the lift, I noticed a child skier coming down the mountain we were about to climb. The coat looked a lot like my kid’s coat and the funny red sunglasses were identical to my eldest daughter’s. She finished her run and jumped on the lift, by herself, and made her way back up the mountain. Sure enough, in the hour and a half since we’d dropped her at class, my scaredy cat older daughter had graduated out of the kids bunny slope and learned to ski with control down a mountain I had yet to even try myself! I’ve never seen her more confident in her movement than on that hill. We followed her up a few chairs back and watched as she navigated her way back down the hill on her skis. She ran into trouble here and there, but easily got herself back on track like a pro. 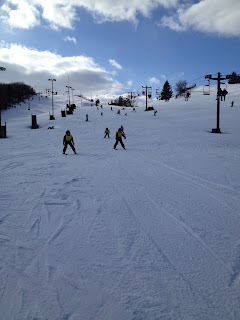 Later, when class was over, we skied together for a few hours. She tripped exiting the lift once, but didn’t even consider her usual crying routine. She laughed at the akwardness of her position and painstakingly found her way back up to a vertical position. She had so much fun that she didn’t want to leave. More than that, she was so proud of herself and the time and energy and falls she’d put in to get to that place of control. Over on the bunny hill, my little daughter was hell-bent on taking the pull rope up by herself. My girlfriend and I rotated off taking her up the hill on the rope, with her and her skis wedged between our skis. She’d say, “I can do it,” yet each time she tried alone, the rope would jerk her so hard that we thought it unlikely she’d make it even foot up alone, so we’d once again grab onto her, straddle her in between our legs, and ride up tandem. Each time we’d get to the top, she’d immediately veer off to the side and say, “Bye Mom,” and ski down the hill herself, willfully getting herself back to the tow rope entrance at the bottom of the hill, in hopes of riding up solo. Finally I let go of the fear of her falling and just told her to try it. As usual, the rope jerked her something fierce, but that little kid did not let go! Up the hill she went, skis parallel. She let go of the rope just short of the top and started to slide down backwards before falling into the snow, but she made it back to her feet, and skied down the hill from there. That daredevil must have taken the tow rope back up that hill twenty times that afternoon. She was proud as a peacock! She was trying to tell other kids how to use the rope and in one case, offering advice to a mother trying to teach her own kids how to use the rope. We sometimes forget how important that feeling of accomplishment of doing something on your own. Doing something that no one else can take credit for, something that requires sacrifice, and sometimes blood, sweat, and tears. We owe it to our children to let them experience joys, trials, and tribulations, or learning how to make it on their own two feet. They’ll be falls and spills and slides backwards, but they’ll make it…if we just stand back and let them.